With many people still unsure about smartwatches, manufacturers are coming up with innovative new designs to try and tempt consumers into purchasing their devices, such as the MyKronoz ZeTime Hybrid with its mechanical hands. Now, Vienna-based brand What? has launched a Kickstarter for a wearable that can definitely be described as unique: a smartwatch that inspires wearers by displaying inspirational quotes. 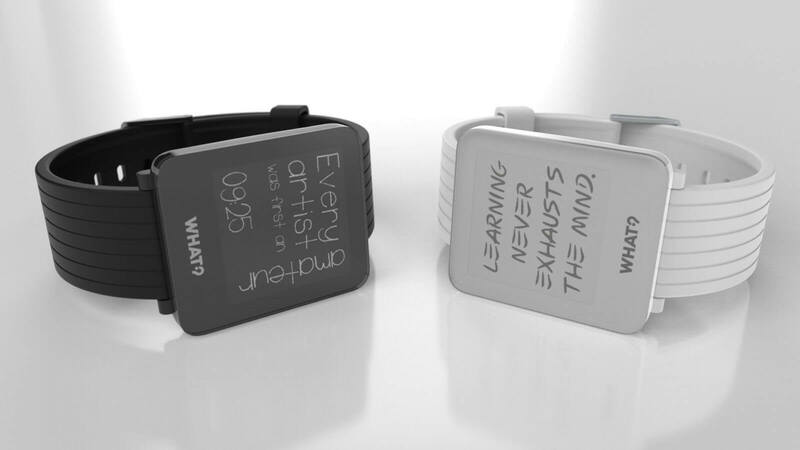 The aptly named Quotes Watch features a dot-matrix e-paper display that shows the time alongside different quotes to keep your spirits up. You simply Bluetooth link the device to the companion app, available for Android and iOS, and select your favorite quote categories from the connected database. You can also personalize the watch face using a range of different fonts and style filters. But displaying inspirational lines isn’t the device’s only trick. Any family and friends using the Quotes app that have you listed as a contact can send messages that appear on your watch. Moreover, the wearable can also display tweets from your Twitter timeline in real-time. With 28 days left to go, the Kickstarter campaign has already raised over $10,000 toward its goal of $25,000. Ordering one early will get you a Quotes Watch from $92 (the final retail price will be $159). It comes in five different colors, and there is a wide range of accessory straps available. What? says the estimated delivery date is October 2018.